It's not the cheapest business-grade notebook but it is good value if you need a sturdy, secure but still somewhat stylish option. Not every business user needs a super-light, super-thin notebook, or a hybrid, convertible, 2-in-1 tablet plus notebook option. HP thinks plenty of workers want a sturdy, powerful laptop with good specs that can shrug off fingerprints, stand up to the rigours of the road (and any passing hacker) and keep going all day. That's the promise of the HP EliteBook 820 G1. It's a 12.6-inch business notebook in functional black and grey that's crammed with ports and security features. It's got options for everything, from a backlit keyboard and SSD storage, to a smartcard slot and 4G. It's also rated to the kind of military specifications that mean you don't have to worry about knocking it off the table or spilling coffee on the keyboard. It's not a clever-clogs like the Fujitsu LifeBook E743, with its component-swapping module that can fit in a Blu-ray player or LED projector. 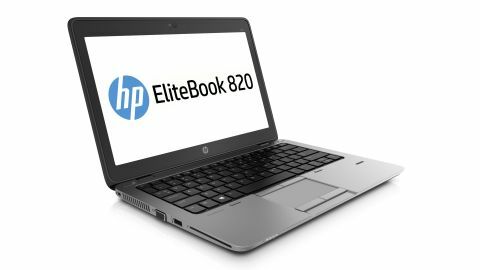 The EliteBook 820 is more straightforward. It's also more up to date than either the LifeBook or the Lenovo ThinkPad S431 Touch. What we've got here is a Haswell notebook that's under three pounds and packing the smallest battery, despite its unibody magnesium alloy chassis (although it doesn't have the touchscreen option of the ThinkPad). It's targeting the same business users as the latest Toshiba Portege Z30 and Dell XPS 13 (both with Haswell), but it beats the measly two USB ports of the Dell offering hands down. It's also a little more portable thanks to the smaller screen. The Portege Z30 has the closest spec, but with a larger 13.3-inch screen (although Toshiba's experience in ultraportables means the Z30 weighs a little less than the EliteBook 820, depending on which options you choose).